Background: Bone Gamma-carboxyglutamic acid (Gla)-protein (BGP or osteocalcin) is a vitamin K-dependent protein involved in the regulation of bone mineralization. Smoking is a risk factor for osteoporosis. Methods: We carried out a secondary analysis of the Vitamin K Italian (VIKI) study to investigate the association between cigarette smoking and BGP levels in patients with end stage renal disease. Data were collected in 370 haemodialysis patients, 37% (136) smokers (or ex-smokers) and 63% (234) nonsmokers. Vascular calcifications and vertebral fractures (quantitative morphometry) were identified on spine radiographs. Results: Smokers had significantly lower BGP levels (152 vs. 204 µg/L, p=0.003). Smokers had lower plasma phosphate levels (4.2 vs. 4.7 mg/dl, p<0.01). 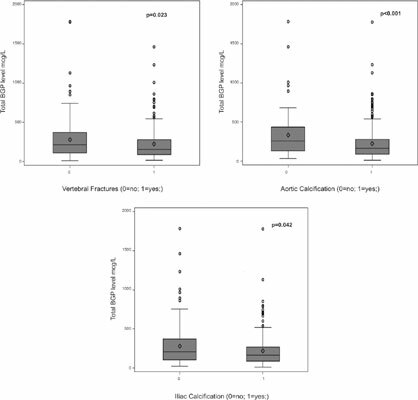 Lower BGP levels were associated with aortic calcification (p<0.001), iliac calcification (p=0.042) and vertebral fractures (p=0.023). In addition, the regression model showed that smoking is associated with a significant reduction of total BGP levels by about 18% (p=0.01). Conclusion: This is the first clinical study in a haemodialysis population, which identifies cigarette smoking as a potential factor that can lower BGP levels, a protective agent in bone and vascular health. BGP, osteocalcin, bone, smoke, haemodialysis, vascular calcification, vertebral fractures.